Cholesterol has become a confusing subject because for decades people were told that all cholesterol is bad which caused millions of people to start taking statin drugs. Now medical experts are disagreeing about the widespread use of statins. One thing that all heart doctors agree on is that a healthy diet rich in fruits and vegetables is key for supporting a healthy cardiovascular system. 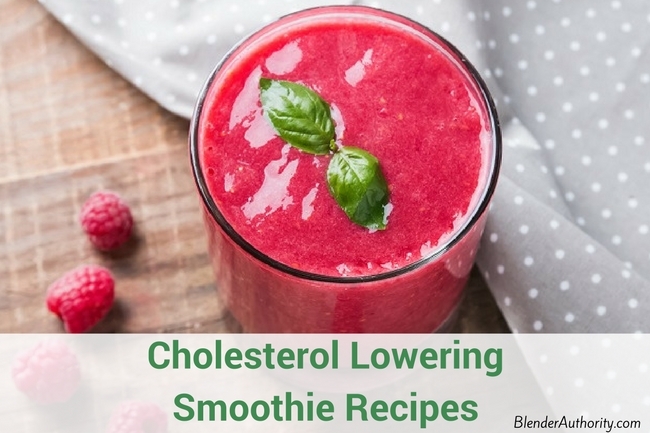 Smoothies are one of the easiest and fastest ways to get your daily fruits and veggies so we put together this guide to our favorite ingredients and smoothie recipes to lower cholesterol. Cholesterol is a sterol, which is a steroid that contains the –OH alcohol group. It is a type of lipid molecule so it’s like fat. Cholesterol is produced by the body because it is an essential component of cell membranes. It is also used to produce hormones, bile acid, and vitamin D, all of which are essential to living. Our body does a great job of regulating the production of cholesterol, but we can throw off the levels of cholesterol in the body by eating foods that contain cholesterol. A natural way to control cholesterol levels is to stay away from foods that are rich in cholesterol such as butter, animal fat, fatty meat, and full-cream dairy products. 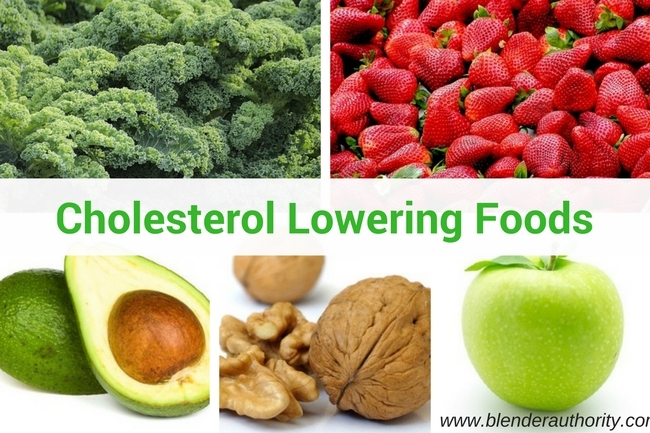 While statin drugs do help those with high cholesterol to inhibit the body’s biosynthesis of cholesterol, eating certain foods also help to lower cholesterol, specifically the “bad” cholesterol known as LDL or low-density lipoprotein. The other type of cholesterol in our body is HDL or high-density lipoprotein. LDL and HDL travel in the bloodstream. LDL is lower in density so it is bigger and can combine with substances on the artery wall to form plaque. The thicker the plaque, the lower the effective area of the artery is for blood flow, which leads to cardiovascular diseases. Blockage of the coronary artery causes heart attack, while blockage of the carotid artery causes stroke. HDL, on the other hand, removes LDL and other lipoproteins to the liver for disposal. That’s why it is known as the “good” cholesterol, and LDL is the one that is in our best interest to lower. 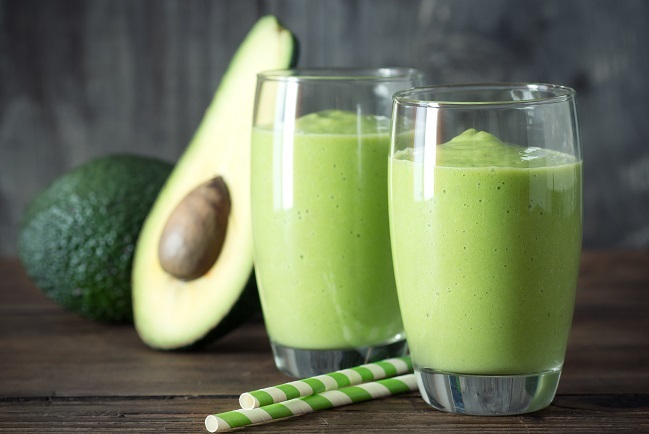 Studies have shown that this is possible by eating the following foods and what better way to eat them than to use them as ingredients in smoothies? Integrating the following natural ingredients into your daily smoothie will support healthy cholesterol levels and help you feel great. Studies have shown that consuming strawberries can reduce oxidative damage to LDL. This oxidation is what causes LDL to bind to the artery wall and form plaque. The result is a reduction in LDL (since it gets removed by HDL) and the ratio of LDL to HDL. Oats contain lots of soluble fiber. Soluble fiber is known to bind cholesterol in the digestive system for eventual removal with the fiber as bodily waste. Oats also contain polyunsaturated fats which have been shown to lower LDL and total cholesterol levels. This is also true for other whole grains, which you can use as substitutes. Walnuts are rich in mono and polyunsaturated fats. Unsaturated fats have been shown to increase HDL, which, in turn, will help to reduce LDL and total cholesterol levels. In addition, walnuts are also high in soluble fiber (see Oats above). You can also substitute walnuts with almonds or other nuts. When making smoothies, the best alternatives are almonds and mixed nuts. Leafy green vegetables contain bile acid sequestrants that bind bile acids for eventual removal as bodily waste. Since cholesterol is a precursor of bile acids, the body will use up cholesterol to make more bile acids, therefore lowering the cholesterol level. The most effective leafy green vegetables are spinach, kale, and Brussel sprouts. In addition, these vegetables are also high in soluble fiber (see Oats). Avocado is a great source of monounsaturated fats (see Walnuts) and fiber (see Oats). A study showed that eating an avocado a day, while following a heart-healthy diet, can reduce LDL cholesterol levels. This study was done with overweight and obese people but there is no reason to believe that avocado wouldn’t be effective for everyone. Apples and citrus fruits are particularly high in pectin, which is a complex set of polysaccharides found in the cell walls of plants. It is a soluble fiber, and the commercially available dietary fiber supplements tend to come from citrus fruits. Pectin has been shown in numerous studies to lower LDL cholesterol level. Our first ingredient, strawberries, also contains pectin, so do many other fruits. 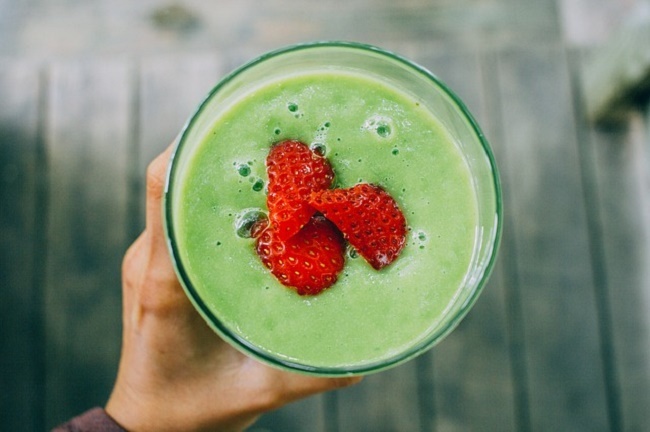 Apples and citrus fruits just happen to be awesome ingredients for making smoothies. Flaxseeds contain soluble fiber (see Oats) and omega-6 and omega-3 fatty acids in the proper ratio of 3:1. Omega-6 and omega-3 fatty acids are polyunsaturated fats, which have been shown to lower LDL and total cholesterol levels. One study found that calcium and other bioactive components in yogurt may alter the bad effects of LDL cholesterol and triglycerides. Other studies have also found promising links between probiotics found in yogurt and lower LDL cholesterol levels. 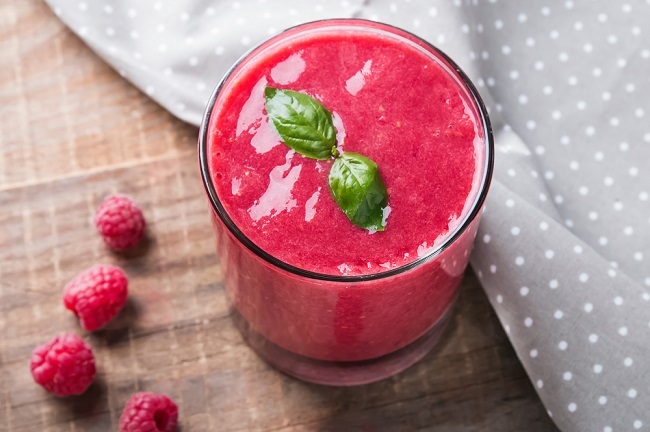 These smoothies are full of beneficial ingredients that support a healthy cardiovascular system. 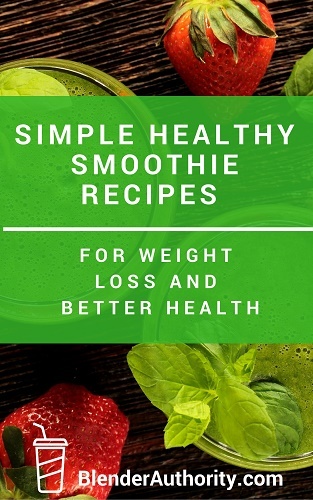 All of these smoothie recipes are portioned to work with most blenders including personal blenders. Cholesterol lowering ingredients used: strawberries, spinach, Citrus fruit. Cholesterol lowering ingredients used: apple, avocado, flaxseeds, yogurt. 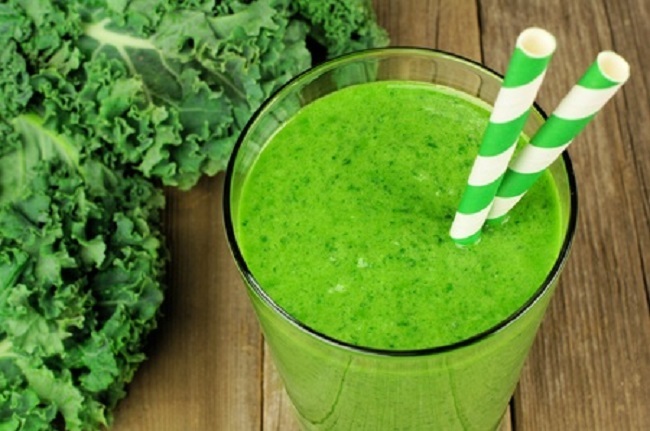 Cholesterol lowering smoothie ingredients used: apple, kale, walnuts, oatmeal. Cholesterol lowering ingredients used: strawberries, raspberries, almonds, raw oats, apple. Excellent recipes 😊 thank you!! !